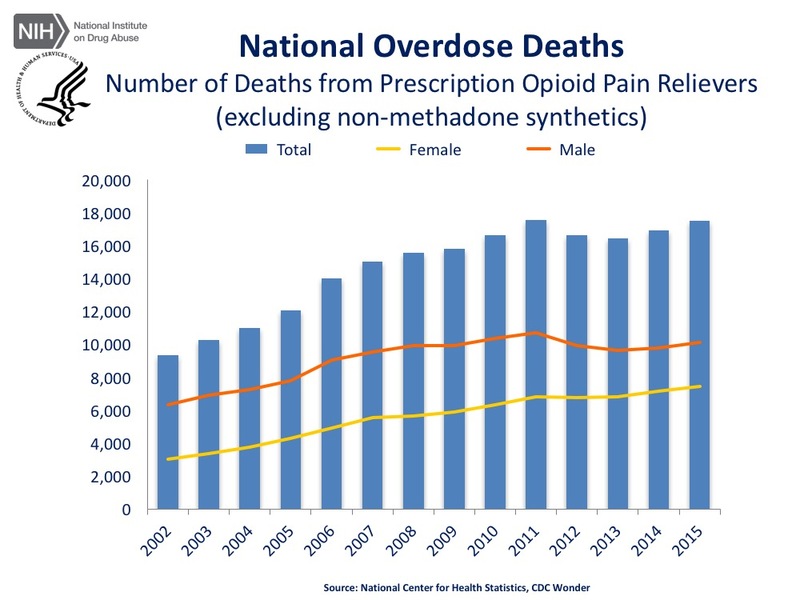 National Overdose Deaths—Number of Deaths from Prescription Opioid Pain Relievers (excluding non-methadone synthetics). The figure above is a bar chart showing the total number of U.S. overdose deaths involving opioid pain relievers (excluding non-methadone synthetics) from 2002 to 2015. Non-methadone synthetics is a category dominated by illicit fentanyl, and has been excluded to more accurately reflect deaths from prescription opioids. The chart is overlayed by a line graph showing the number of deaths of females and males. From 2002 to 2011 there was a 1.9-fold increase in the total number of deaths, but it has remained relatively stable since then.